A couple from QLD are aiming to collect 810,000 bottles to recycle via the via the QLD container refund scheme to pay for their wedding. The ABC reported Leonie Starr and Matthew Porter are planning to use the scheme to raise the $81,000 to cover the cost of their Vanuatu wedding. Ms Starr and Mr Matthew have calculated a daily target with the hopes of funding the nuptials which are planned for March 2020. “It scared me for a second until I realised what was included. It’s an amazing island and he (Matthew) was onboard till he saw the price,” Ms Starr said. “I have been waiting for the scheme to come to Queensland for about a year. When it launched, we went about three or four times before we started realising that this could pay for the wedding. “Once I did the calculations I thought we could give it a go. Ms Starr said that initially family and friends were surpised by the idea but gradually got on board with the plan and have been contributing to the couples growing collection. 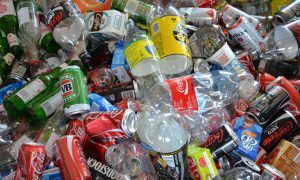 Kunda Park depot manager Craig McDougall who operates the refund scheme on the Sunshine Coast said people are starting to treat bottles and cans as currency, the ABC reported. “I think it’s fantastic. I think that’s going to help that young lady pay for her dream wedding. It means more litter out of the ocean and off the streets. It’s win-win for both parties,” Mr McDougall said. “I’ve got a young lady who comes in every day with her dad and does about $50 a day and she is trying to save for a car. She is up to about $900 a week, so I’m seeing it everywhere,” he said.